Sharks are an incredibly diverse group of fish. Between 350 and 500 species of shark, all existing ones in the superorder Selachimorpha. Sharks have prowled the world’s oceans for almost 400 million years. Over the ages, these fish have co-evolved with the organisms they interact with, producing a variety of relationships. Sharks prey on some species and are themselves the prey of other species. Outside of that, sharks have commensal, parasitic and mutualistic relationships with other organisms in their ecosystem. Some sharks are apex predators -- they have no natural enemies as adults; great white sharks, tiger sharks, whale sharks and basking sharks are generally free from worry. Smaller sharks are not as fortunate; killer whales and large sharks prey on small to medium-size species. Unfortunately for the sharks, humans are the greatest threat to their survival: They are hunted for food and persecuted out of fear. Sharks as a group feed on a variety of prey species, encompassing nearly every category of animal found in the ocean. Fish form a large portion of most shark species' diets, but seals, sea birds, sea turtles, squid, stingrays, jellyfish and shellfish are important staples for some species. Some sharks specialize on a single food source; for instance, hammerheads (Sphryna ssp.) often prey upon stingrays. Others, meanwhile, like tiger sharks (Galeocerdo cuvier), will consume nearly anything they can get their mouths on. Sharks, like most organisms, are host to a variety of parasites. Tapeworms often live in the intestinal tracts of the sharks, and they derive nutrients directly from the sharks. Though tapeworms are classical parasites that benefit from their host while harming it -- the worms are stealing some of the shark’s calories -- new evidence from the University of Tehran, Iran, may change this view. Masoumeh Malek and his team showed that shark tapeworms remove heavy metals from the sharks. The study, published in a 2007 issue of the journal “Parasitology,” showed that the sharks’ health was much better than it would be without the tapeworms. If the sharks benefit more from the toxin removal than they are harmed by the loss of nutrition, the relationship is mutualistic, not parasitic. Remoras (Remora remora), or shark suckers, are peculiar fish who subsist by clinging to sharks and other large ocean-dwelling animals, such as sea turtles and manta rays. Equipped with a sucking disk on the top of their heads, remoras ride along attached to sharks and feast on bits of fish and debris produced by the shark’s feeding. For some time, this was thought to be the remora’s only food source; accordingly, the relationship was defined as commensal -- a relationship in which one party benefits from the relationship and the other is neither harmed nor helped. 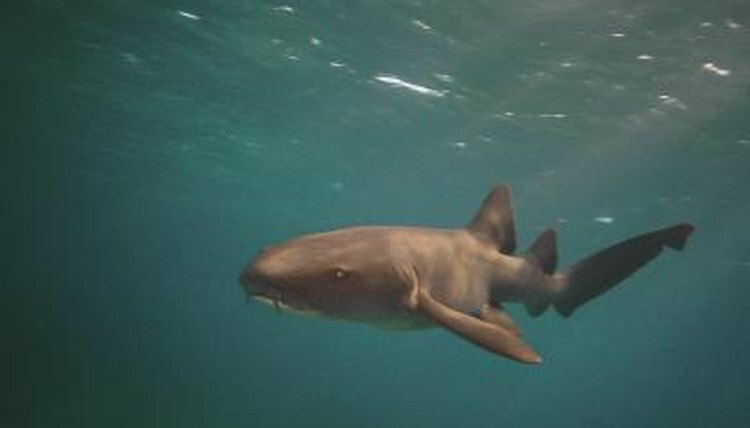 However, with research indicating that remoras also consume ectoparasites found on the sharks' skin, the sharks benefit from the relationship as well, and therefore the relationship is best described as a mutualistic. Remoras apparently are not eaten by sharks, as they have never been found in the stomach of one. It is not known whether sharks tolerate remoras or if they simply can’t catch them. Pilot fish (Naucrates doctor) are small fish that can be seen swimming alongside sharks. Called pilot fish because they seem to be piloting the larger sharks, much like tugboats pilot sea-going vessels, these pilot fish eat bits of food left over from the sharks’ meals. Pilot fish associated with white tip sharks (Carcharinus longimanus) are known to change color. Normally covered in dark, vertical bars, these fish have been observed by scientists changing colors to a silvery-blue color when chasing away other pilot fish. Detailing their observations in a 1971 issue of "Copeia," authors John J. Magnuson and Reginald M. Gooding noted that in these interactions, the pilot fish were driven up to 17 feet away from the host sharks.